Hi Friends! Welcome back to Healthy Grocery Girl. Today I’m sharing with you how to make one of my favorite soup recipes which is a White Bean, Kale & Potato Soup. This recipe is from our Healthy Grocery Girl Member Fall Meal Plan which is my favorite seasonal meal plan we’ve created. Even if it’s not Fall our seasonal plans still have great recipes that can be enjoyed year-round. 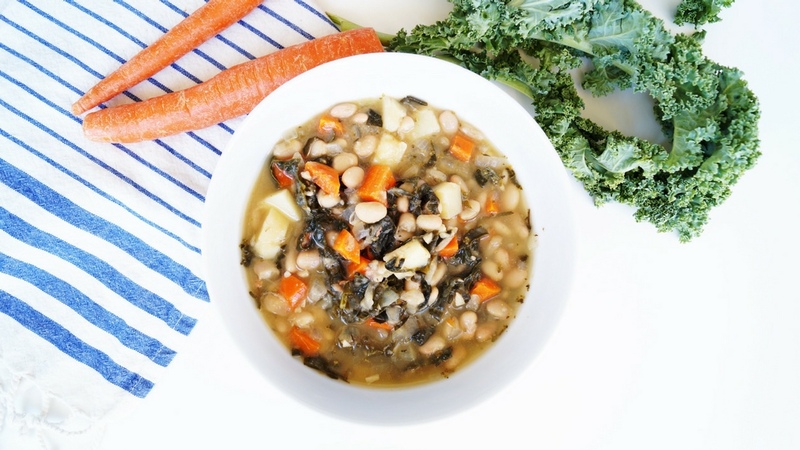 This soup has protein from the beans, energizing carbohydrates from the potato and nourishing ingredients like kale and garlic. This is a great meal prep recipe for busy work days, if you’re expecting and want to stock your freezer with meals to enjoy after baby arrives or if you know someone who had a baby and you want to bring them a great recipe that will last for days. I’m actually making this video to share with you the recipe and then I’m putting the soup in Mason Jars in our freezer for Aaron and I to enjoy after our baby arrives! As I mentioned this recipe is from our Fall Meal Plan. If you’re not an HGG Member yet I invite you to join us! We provide weekly recipe guides with shopping lists, a private FB group community, plant-based video courses and guides, seasonal meal plans and so much more. It’s a great community and resource for balanced meal plan inspiration and education to eat a nourished plant-based diet. You can learn more at HealthyGroceryGirl.com/JOIN! You can also follow me on Instagram @HealthyGroceryGirl for daily recipe, wellness & healthy living inspiration!